After checking out tons of available planners for several hours I decided on this pink one by the brand Leuchtturm1917, which had the best layout for my needs. It's divided into weeks with a separate page for notes besides. I think planning in terms of weeks is the best option so you get an overview of which topic you already covered recently. Also when you have a schedule with a special amount of posts per week this overview allows you to find the best day for the respective posts. As you can see I divided each weekday into three categories: "post" which means the actual post I wanna publish that day, "to do" which are things I need to do for my blog that day and "term" for blog related events or appointments that take place that day. Furthermore I made use of the note pages in different ways. Each month has a page about post ideas, one about reviews I need to write, one about my blog stats and a check list for more traffic. 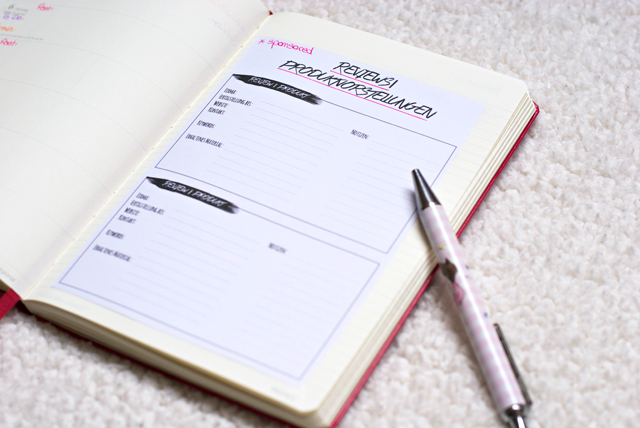 As you can see above I'm using a nice template for sponsored reviews which has been taken from an online blog planner template which you can get for free on Kreavida. At the end of the planner there are several more blank pages which I used for a social media stats overview, my blog finances and the design information of my blog. Furthermore the planner came with a separate booklet for contact details (of fellow bloggers, people I have worked with and people whom I've met on events) and another yearly overview which I used to record birthdays of blogger friends. 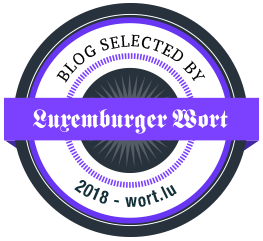 Of course everybody needs to find the layout and thematic division that works for their needs but I guess I covered all the important fields I need for an effective blog planning. So I definitely can't wait to fill in all the fields from January and I'm sure it's gonna be an awesome year in terms of blogging. 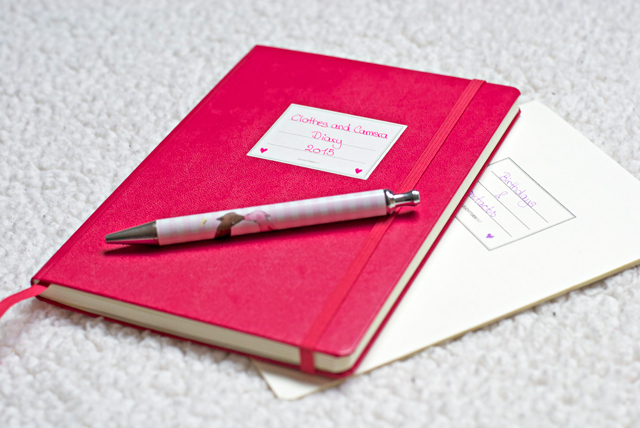 If you wanna make your own blog planner for 2015 you still have some time left and as you could see it's really easy once you found a suited planner. 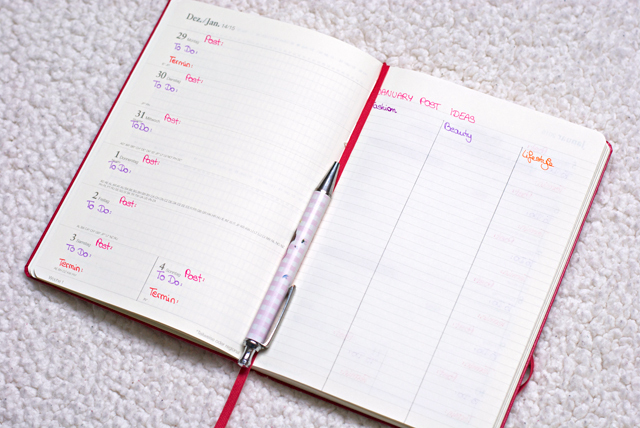 How have you been scheduling your posts so far? 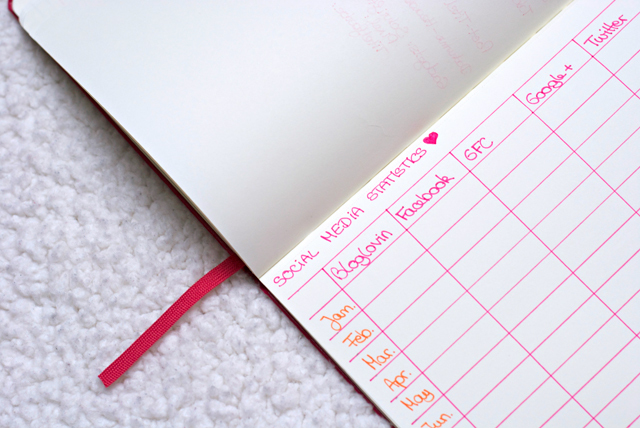 Do you have any other suggestions to make a blog planner even more handy? hi carmen, you're so organized..
now that's what I call professionalism! wish you a lot of success in 2015! I loved it! I don't have one and that kaes me a mess, oout of the blogosphere for a long time, but at least I see your updates on facebook! Great idea and thanks for that! Fantastic idea, Carmen! It's weird saying my name & talking to someone else haha. 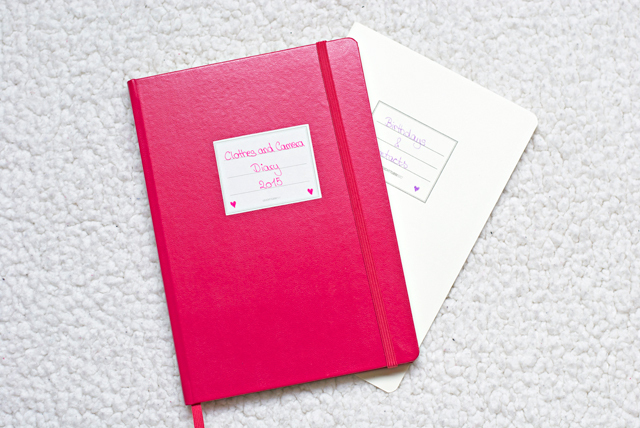 I began a blogger planner, but I like yours better! I need to divide it into weeks as well. Supercool idea and clearly designed with so much love!